TaskBook is the perfect rugged tablet solution for warehouse operations: with its optional handgrip that integrates either a standard or extra-long range 2D imager along with a hot swappable battery. 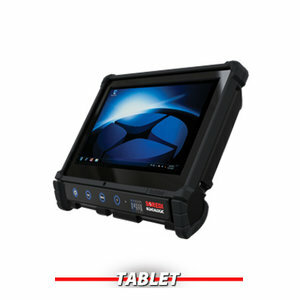 The TaskBook is a rugged tablet expressly designed for rugged applications and one-handed operations, available in a 7 inch and 10 inch display. With its optional handgrip that integrates either a Standard or Auto Range 2D imager along with a hot swappable battery, the TaskBook provides top efficiency with its single-handed scanning operation and ability to operate 24/7. The optional docking station can be fully integrated into a forklift for a flexible vehicle mount solution, perfect for small forklifts or where mobility is required. With an IP65 rating, a rugged housing that protects the device from the most hazardous environments, Corning® Gorilla® glass with 1.6 mm thickness (4 times better than consumer grade!) and 1.2 m / 4 ft repeated drops to concrete, the TaskBook can be used in most any extreme environment for applications such as logistics, maintenance, quality control, and inspections.